Today was an exciting one. Connie Fails and I presented our project the Curbside Couture to a group of 200+ young people and adults about the evolution of our project. We shared with the audience how the idea started and what is involved in sustaining the recycled fashion show for the future. 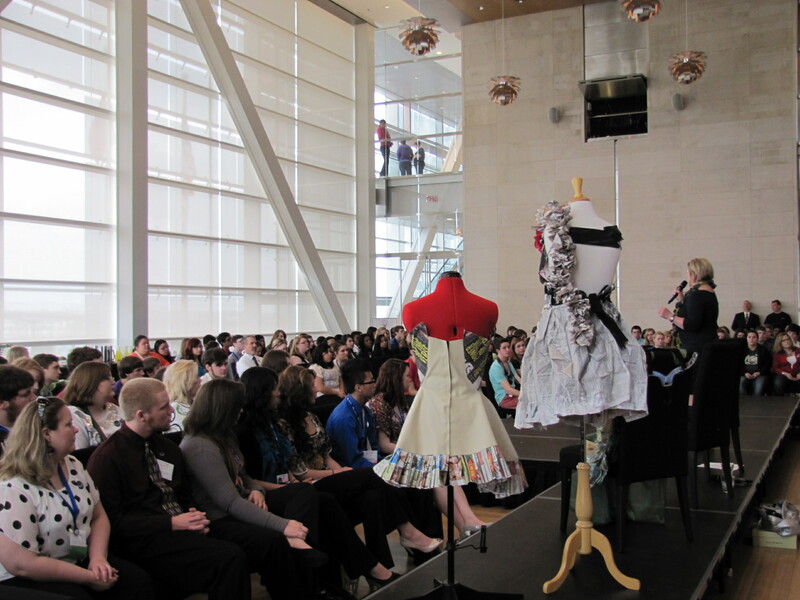 Our audience was amazed at the creations students created with free, recyclable materials, and all without sewing machines. I shared ideas on how to gather materials, organize interested students, how to put it all together to create a garment, and how they can get involved in our runway fashion show. We walked away feeling that we inspired more students, teachers, and adults to get involved. We influenced others into working with their own communities by creating their own show or creating a project on their own to improve a part of their community. The important part is to have everyone realize you do not need money to get started, you just need energy, ideas, and creativity. I introduced Tyree Guyton and Bill Strickland as individuals who inspired communities to create change using creative people and ideas. Both of these talented and creative people made positive change in their communities. Tyree reused, recycled, reorganized the items cast off in his community in Detroit to bring pride and positive energy to bring change for a forgotten area of Detroit. Bill Strickland understood the trans formative power of art while he was a ceramic student in school. He remembered how it empowered him and created a desire to share this with other students. He successfully built a school to create skills to lead to creative careers for inner-city students that many had given up on. Bill inspired other creative people to invest in his idea and he has provided the city of Pittsburgh a wonderful organization to educate so many students who would not have had opportunities to pursue careers. It is my hope that I was able to convey the importance of Art Education in schools. How we all learn differently and creative people are necessary for our success. We need to support the arts to help grow our communities and reinvigorate our economy.